Do not judge anyone form their appearance! Just look into them and you will find the real beauty lies within. Hi, really beautuful capture.. this butterfly is great..
love the angle of the shot and the texture of the leaf.butterfly too.how do u get all these shots?may be i have to make a trip to your home garden. Thanks for the comment. This is not my home garden MD. 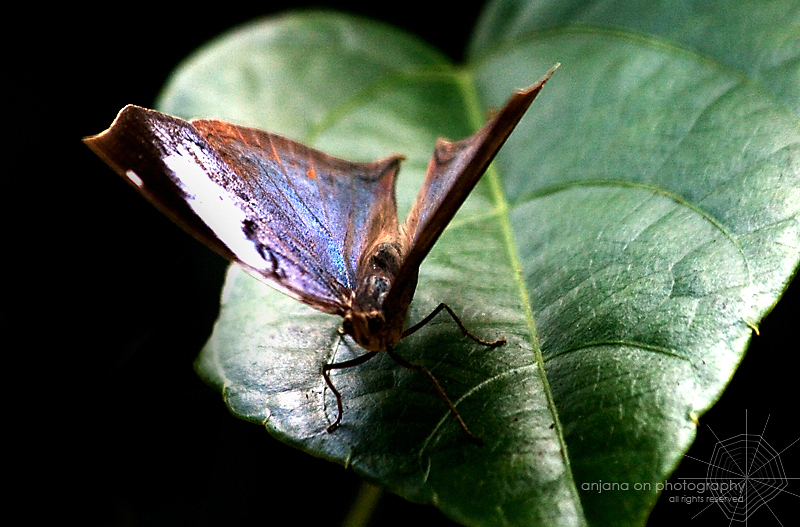 I snapped this while I was visiting the “Sinharaja rainforest”. If you check the labels on my post you can see where that I have taken each and every photo. How I took this pic? If you check my previous post I photographed it from the left side of this critter. Since the light and the clear background it looks more bright and colorful. But to get this angle I had to move in front of it. Since I move in front I get the trees behind as my background and it was too dark too. That’s how I ended up with this pitch black background. how close were you to the butterfly when you took this? Thanks for your lovely comment Frieda. He has a very shiny wing! Ya, but wish I had a chance to see a full view of it.